Apple on Wednesday announced customers can now view their medical records on its Health app with the iOS 11.3 beta. 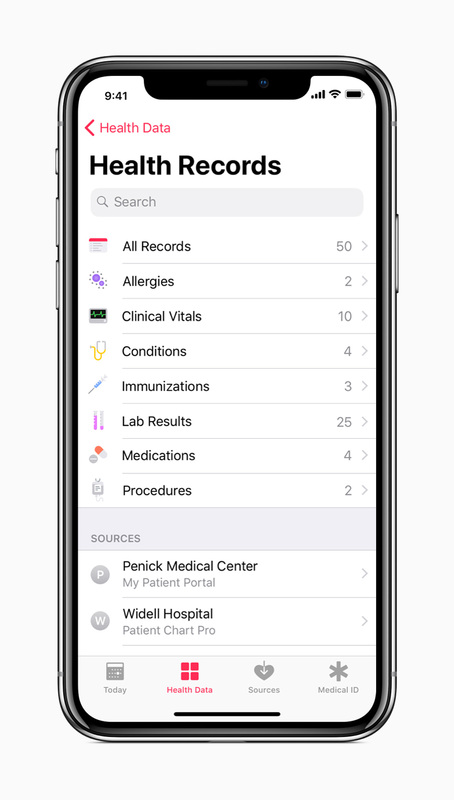 The updated Health Records section in the app "brings together hospitals, clinics and the existing Health apps" so users can view their available data from disparate medical sources, according to the company. The news is the culmination of the work around Apple's PHR company Gliimpse, which it bought in 2016. After months of speculation and leaked plans, Apple has finally revealed a PHR initiative. Health Records is based on the interoperability standard FHIR and collects encrypted medical data on allergies, conditions, immunizations, lab results, medications, procedures and vitals. Users will receive notifications when their data are updated. The updated app is still a test version, but hospitals already contributing medical records include heavy hitters such as Johns Hopkins Medicine, Cedars-Sinai, Dignity Health, Geisinger and MedStar Health. Apple announced 12 participating health organizations but expects more medical facilities to connect in the coming months. PHRs have been a tough nut to crack in the healthcare space. Microsoft recently pulled away efforts from a machine learning PHR research project. Apple can leverage its easy-to-use design and brand loyalty to tame the PHR beast. The ability to for Apple Health users to feed data from existing portals and view that information on an iPhone caught Eastwood’s eye. “It addresses the portal usability challenge,” he said. There’s a clear benefit for patients who need to manage multiple medical records and build a health history in between visits. In addition, users would be able to share their medication and diagnosis information to multiple clinicians and specialists they may be visiting. Some caveats remain. For one, Apple’s operating system market share lags behind Android’s. An issue of affordability arises as well. The iPhone’s price point can deter individuals who could benefit from the medical record feature but can’t afford an iPhone or a large data plan. There is also the challenge of presenting medical information so the Average Joe and Jane can understand the data and/or spot discrepancies. Apple CEO Tim Cook has messaged the company’s healthcare initiatives may never make money but the ability to pull together different EHR systems and making that data easily available to users helps address PHR’s adoption challenges. The industry will be watching to see how customers react and how the product scales. Health organizations can find more information here.